Just what poker needs … another podcast! Yep, I know … but this one is different, it’s special … Vegas Grinders we’re calling it — featuring yours truly @Pokerati with @AndrewNeeme and @RandomPoker …just a few dudes grinding out a life in poker, telling you what’s going on at the local tables. This week we talk about Michael Phelps’ residence in Vegas and his play at Aria and the Palms; and we compare and contrast the WSOP Circuit event at Caesars Palace and the Venetian Deep Stacks, both of which were playing at the same time in February. Andrew, as it turns out, may or may not be on tilt after bubbling the $365 WSOP-Caesars PLO. We also take a look at the recently released 2013 WSOP schedule, and question the hairiness factor in the new variable buy-in “ladies” event. All that, plus the Millionaire Maker and LOL the tag-team charity tourney this weekend at Binion’s. We wanna know, will Dave ever get there on his heart draw? Have a listen to episode 1. And if you don’t like it, well, you know … you really probably should! Cards got in the air shortly after 6 pm for a 1-2 no-limit and 2-4 limit game, both 10-handed. Though inside a Leroy’s Sportsbook, the casino operates the two-table room, which is next to the cage and slot machines, but out of earshot from the karaoke bar. Jamie Gold Residency Shuttered at the Trop? 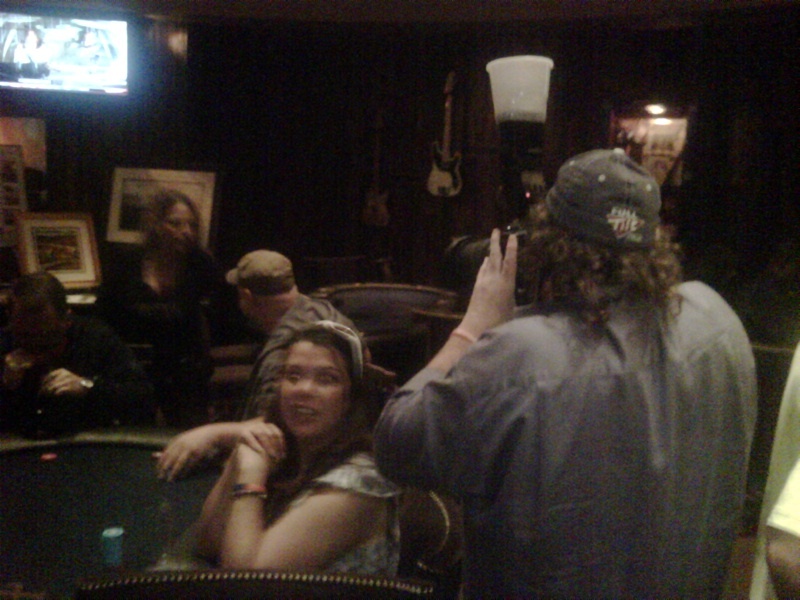 The unceremonious close of Jamie Gold’s short-lived affiliation with the Tropicana poker room. Less than one month after the “Official Grand Opening of the Jamie Gold Poker Room,” the relationship between the Tropicana and the 2006 WSOP main event champion has apparently ended — more quickly than it began. 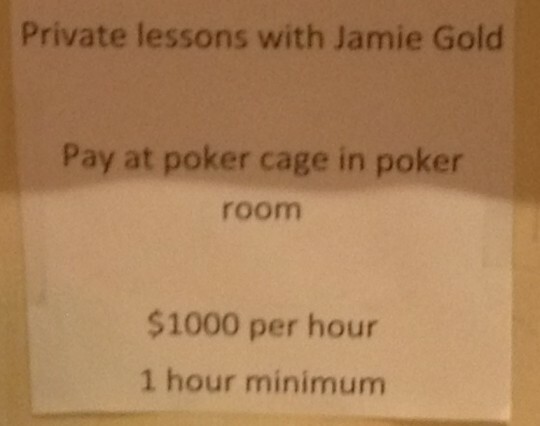 Though no word yet from either side about what prompted the abrupt change of course, posters of Jamie Gold, hands to the sky, and videos of him daring players to “catch me bluffing” are gone. The Feb. 17-19 launch-party weekend included a Sunday afternoon “second chance” tourney that got canceled when only two players registered, and Gold himself showed up an hour after cards were supposed to have gone in the air. But the 2/5NL game (with David Williams and other pros) that sprung up in the Jamie Gold room looked to be growing successfully — running regularly on Wednesdays and Saturdays — as it was fast becoming known as the biggest 2/5NL games in Las Vegas, with reports of pots as big as $20,000. 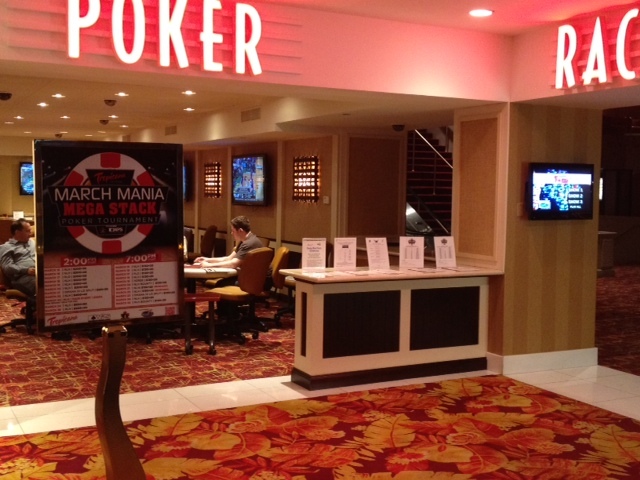 Now the Gold promotional posters have been replaced by signs for a March Mania Mega Stack Poker Tournament, which starts today, March 15, and runs through March 25. The casino just released the schedule for its next Deep Stack series, set to run May 24 to July 15. There’s no DSE next month, however, meaning there will be only three this year. Instead, they will host the Spring Big Bounty Festival from April 12-22, also at Palazzo. Since 2009, there have been four Deep Stacks a year inside the Venetian Poker Room, with events starting in January, April, May and October. That changed in January and February, when players battled in this year’s first Deep Stack Extravaganza in the main casino area of the Palazzo. With the Venetian being home to the largest poker room in Las Vegas, there’s no word on creating a permanent poker room inside the neighboring tower. But the tournament shift to the Palazzo — because of already crowded Venetian poker room — appears to coincide with rumblings about expansion. For at least a couple of years, there’s been talk about making the Venetian, currently 52 tables, even bigger. 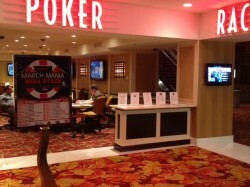 Already, a roped off area outside the main poker room handles the daily tournaments. Now, word on The Strip is that work on Venetian’s poker room could start as early as August. The plan supposedly calls for upwards of 90 tables, new chairs, bigger and better TVs, and tearing down the high-limit wall for better space. Several attempts to reach casino officials about tournament and poker room changes were unsuccessful. But it looks like Las Vegas Sands Chairman and CEO Sheldon Adelson might start throwing some money at more than just Newt Gingrich. LOL, but does it come with a happy ending? Really … $1k an hour? I mean that’s not quite Carrot Top money, and supposedly Gold’s already had five students pony up … but jeesh … you’d think at that rate they could at least afford a nicer sign! The redevelopment of the the Palms Poker Room continues. While some of us can’t wait for the state-of-the-art-in-2003 room to step into 2005ish with the coming addition of an electronic Bravo check-in system … Joe, Bobby, Eldon and crew are pushing forward with their plans to bring non-$20,000 tournament action back to the Palms … starting with a Tuesday-night $100 HORSE tournament. They say $100 HORSE at the Palms is the Colonial Yellow ’79 Cadillac of Poker. It may not be PLO, but hey, I’m no one-trick pony. More like a half-trick pony, lol. But regardless, I’ve been meaning to sack up and get more live, low-stakes Razz under my belt. (I dominated the $1,500 event in the ’07 WSOP for Playstation — won a bracelet and everything!) 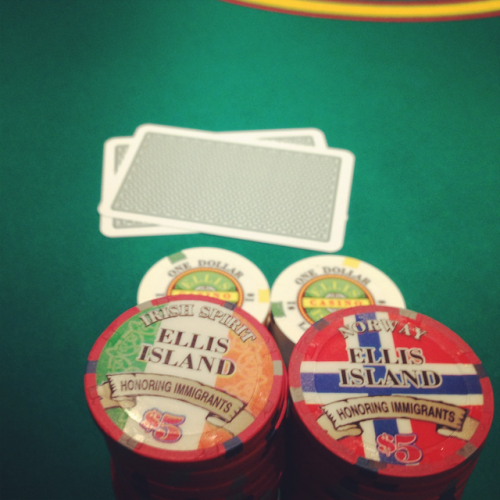 The tournament is just a couple weeks old and supposedly has gotten a great response from the start: three tables of tournament action last week, followed by a $4/$8 HORSE cash game as players started busting. Something similar expected tomorrow. RSVP on Facebook here … and/or just show up @ the Palms tomorrow at 7:30pm. Every Tuesday night 7:30, last week was our first tournament. Also Palms is gonna spread a HORSE CASH game at 5pm ($4/8) Come on down, lots of fun and very playable structure. 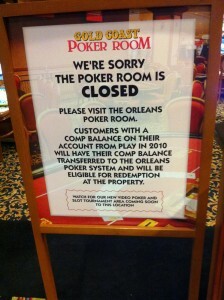 You can LOL all you want because nobody got shot … but as things usually go with poker robberies, attempted or otherwise, someone in the Stratosphere poker room probably has more than a sneaking suspicion of who attempted to rob a single table Wednesday night of its low-stakes casino chips. Or maybe not … because from the sounds of it there might not have been any players around … which makes sense, because as far as I know no one tweeted from the actual scene … so did it really happen? Dude … I’m actually pretty sure I’ve seen him at the tables somewhere. 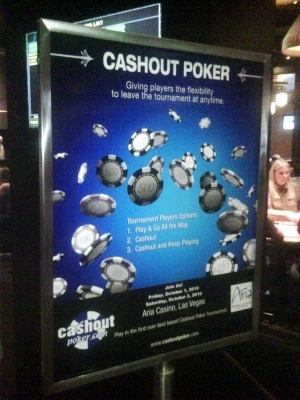 The Gold Coast poker room is apparently no longer … The flat-screens were dark, and tables had been replaced by video-poker and slot machines. And according to the sign they intend to turn the previously post-boom-downsized poker room into a slots and video poker tournament area. Not that anyone misses one of the least raucous, nittiest $2/$4 limit games in town … and I don’t think you can say much about this being a trend of poker continuing to recede or anything like that, but it may say something about smaller rooms being unable to justify their existence when small-stakes players gravitate to the bigger rooms in town. Where to find … ? 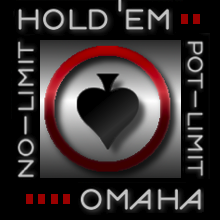 Talk of PLO on Poker After Dark comes as I personally have been jonesin’ for mo-bigger low-stakes PLO … and based on emails, tweets, and Facebook, a stream of Vegas visitors and locals seem to be, too. Interest in PLO may be growing, but players in Las Vegas looking for starter stakes can’t always be sure where to find reliable action. And Aria Poker spreads a vibrant 1/2 NLH/PLO that occasionally makes. 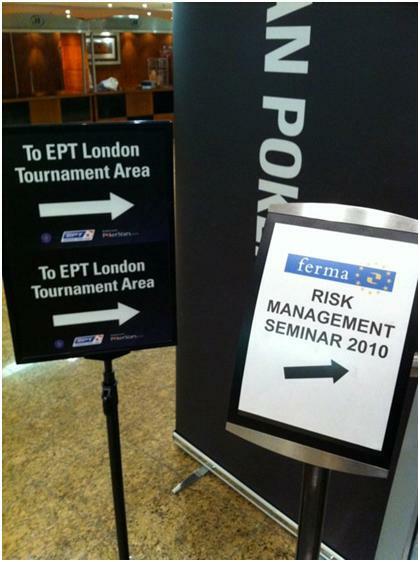 Their game plays most similarly to the Pokerati Game of old — and though it runs only sporadically, Aria often has the game posted on the board with a list of mostly 1/3 and 2/5 no-limit regulars ready to take a seat against any and all PLO tourists. Russ Hamilton Playing 1/2 at MGM? 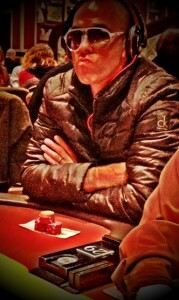 Unconfirmed … so you make the call: Is that everybody’s favorite online poker supervillain Russ Hamilton in the 3 seat? Again, without saying this is for certain any one specific person who has never been formally accused of any crimes yet still finds himself living something of an OJ Simpson retirement … Hamilton has apparently resurfaced from poker exile in the Nevada amateur pub leagues and has been showing up at the MGM about once a week for the past month or so to in put in some hours on the low-stakes grind. Supposedly this player was noticeably a bit tilted by the lingering camera, and quickly got up to put his name on the 2/5 list as “RR”. Damn. Kinda cool to see the lady lion try to help break up the fight. And Papa Lion clearly had it in for that one dude. That’s how it can go at MGM poker … a tame game can suddenly turn brutal. Still contend that the lion wouldn’t stand a chance against Ivey. Also, with no information other than what you just saw in the video, I’ll bet for sure that the overall rake for MGM poker goes up over the next week, even though the number of lion attacks will almost certainly go down. Part of the buzz underlying this week’s Detox Poker activity has been the fate of the Hard Rock Poker Lounge. To be sure, the luxed-out $12 million 18+table poker room that opened in 2008 — nearly two years ago to the day and possibly two-and-a-half years too late — will be closing in about a week. According to casino personnel, almost immediately upon the conclusion of Detox, Hard Rock cash games will be moving to a more efficient 6-8 table spot connected to the main casino area — something with a smaller electric bill, more in line with plans for expanded sports-book offerings, and in view of the round casino’s famously raucous “center bar”. The new poker room — about a third the square footage and in an arguably better location — will replace the former “Hell’s Belles” blackjack pit (hot dealers, go-go dancers, $100 minimum bets), which prior to that had been the “Peacock Lounge” (a pimped-out tribute to Jimi Hendrix). It will supposedly still have its own bar (with video poker, of course), a semi-private nook for high-stakes or VIP games, and a separate poker-player’s bathroom. Management says they’ll be bringing over the same tables and chairs, but are unsure whether or not they will keep the name “poker lounge”. Decisions were also still pending (as of last week) about whether or not the Detox Series would be back and held in a Hard Rock ballroom. The current poker space will apparently become a restaurant.